Did you know that George Washington died after more than half the blood in his body was drained during treatment for cold and fever? Or that the vampire has appeared in more movies than any other fictional character? From ancient history to modern science, blood continues to fascinate us, and author H.P. Newquist cuts beneath the skin’s surface to explain why. 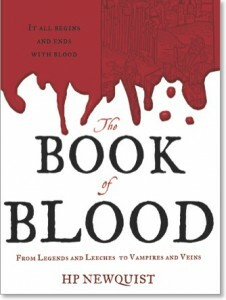 The Book of Blood: From Legends and Leeches to Vampires and Veins is a fully illustrated work that is appropriate for students but just as informative for adults. Whether you are more interested in the science, the folklore, the history, or the many expressions that refer to blood, you’ll discover facts to keep those juices flowing.